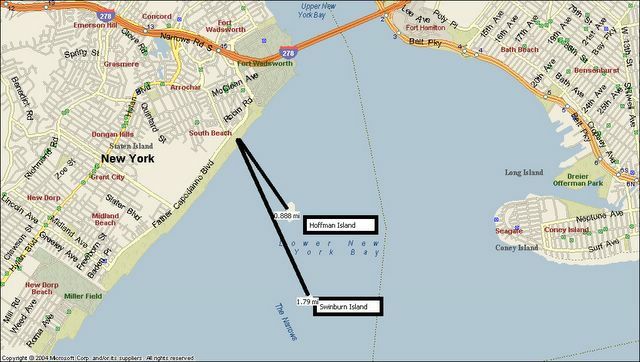 After years of dreaming about going to this small island, just shy of 1 mile off the coast of Staten Island, I set out on my expedition to swim to it with two other swimmers and 7 kayakers. 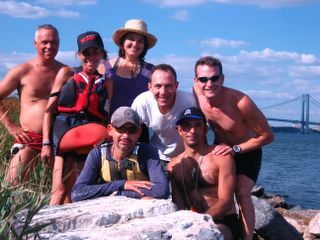 My friends Cristian and Michael were my swim mates and my kayaking crew was led by the indefatigable Tim. Tim and I have been planning a kayaker escorted swim to Hoffman Island for the better part of a year. At first, we were planning a winter expedition, where rumor has it that seals sunbath on the island’s rocky shores. However, foul winter weather and spring and summer race commitments prevented us from pursuing an attempt until yesterday. The journey was arranged on the spur of a moment, prompted by an email from me asking Tim if he was ready to go. The tides dictated that we make a 3pm start from Staten Island to catch the water during slack tide. This would give us plenty of time to reach the island, explore and start back home in time for the incoming tide. Mother Nature blessed us with a perfect day. The sky was crystal clear, the water calm and a northerly wind that was no more than breezy. Someone raised the question as to whether or not we should inform the lifeguards manning the beach that we were going to be swimming straight out into the open water. My response was a definitive no, as we can only be told not to go. It is far better to plead ignorance, than to have positive confirmation that something should not be done. My logic was irrefutable so we hit the surf and started out for Hoffman. I was told later on that we stirred up quite the frenzy with the lifeguards. They were whistling furiously at us and two set out to catch us; one swimming and the other on a long board. Tim waited for us to be well out into the open water, before turning back and letting the lifeguards know that we were expert swimmers; channel swimmers, which in fact was not so far from the truth for some of us. The swim to the island was very pleasant. I quickly settled into a smooth steady stroke and kept next to Cristian for most of the way. I kept the kayaks in view to my right and trusted them to guide me. Occasionally I would look up to see how much distance remained. I was satisfied to see the island approaching steadily. Eventually, the remains of an old pier started to take shape. We swam into the piers by making a right turn, followed by a quick left turn to the shore. We landed on a very small beach made of rocks and seashells which led up to a large stone wall. In the past a dock would allow passengers who arrived by boat to disembark. It was apparent that the dock and pier were reduced to pilings long ago. The kayakers beached their crafts and we all scaled up the rocks to summit the islands retaining wall. Signs were posted on the island that this was a sanctuary for Herons and serious penalties would be imposed for disturbing them. You could see the Herons flying throughout the island and I was able to see numerous nests. We elected not to venture into the middle of the island. I think this was partly because we didn’t want to bother the Heron nests and the vegetation was so thick, that you couldn’t help scratch your legs or getting nasty brambles stuck all over you. If I go again, I will ask a kayaker to bring long pants, so I could have some protection if I venture into the island. Our exploration consisted of walking on top of the retaining wall that formed the perimeter of the island. We were treated to fantastic views of the Verrazano Narrows Bridge, Coney Island, Staten Island, Swinburne Island and Sandy Hook. Occasionally we would stumble upon artifacts from when the island was inhabited. Bits of broken bottles, electrical feeder cables, large anchor chains and lots of bricks and concrete that undoubtedly formed the islands buildings. Eventually, we circumnavigated the island and we arrived back at our landing point. The tide had seriously started its evening push in and the kayaks could be seen bobbing in the low surf. Fortunately, a couple of people remained behind with the boats or else the kayaks could have drifted off. The swim to the island took about 25 minutes. It looked as though the swim back would be more difficult, since the wind started to kick up and the water appeared very choppy. It was starting to get late in the day, so we didn’t waste anymore time to get moving. The kayakers still had to paddle back up the Hudson to the Downtown Boathouse. It was harder to sight the land on the return trip, since the chop was moving into our faces. I just concentrated on keeping a kayak to my right to guide me home. Despite the slightly rougher water, the trip back seemed to pass a little more quickly. In fact, the return time was exactly the same as the outbound trip and according to my heart rate monitor, was an easier swim. The water did settle down once we passed the half way point and I am sure the incoming tide made the swim less taxing. When I landed on the beach, I was greeted by several young children who were filled with all sorts of questions about where I came from. I explained that I just returned from the island out in the distance and they looked at me with utter amazement. I was struck by how something as a 1 mile swim to an island is something that I wouldn’t hesitate to do, but for more others, the thought of doing something “so extreme” is unfathomable. I can’t imagine I am the first person to swim to the island, but I am sure for everyone on the beach, such a thing is unheard of. Tim and his fellow kayakers beached their boats and allowed Cristian, Mike and I to gather our dry items, water bottles and to say our goodbyes. Everyone felt it was a great adventure and were eager to try something like this again. Tim and I at some point will arrange for a time for the longer swim to Swinburne Island. 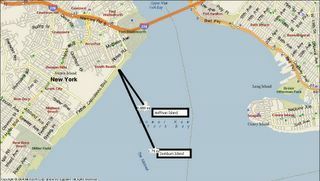 Swinburne is 1.8 miles away from Staten Island and appears to be the more interesting of the two islands. Swinburne Island still has some buildings on it, perhaps one of them is the crematorium that was used to incinerated the remains of those unfortunate immigrants that died of disease they carried from their homeland. Cristian (red suit) and I with our fantastic Kayaker crew. You are totally extreme! I am awed! I swam a mile once, in Boy Scouts; took something like 45 minutes and I'm certain I couldn't do it today. But you did it twice in one day! What was your time, by the way?